MobileIron’s platform is designed to help businesses track, manage, and secure mobile devices throughout an organization. This service allows companies to mitigate security risks while taking advantage of mobile technology’s benefits. Mobile IT appeals to companies seeking a secure mobile device management solution that will increase collaboration and productivity. MobileIron is utilized by companies around the world, such as Barclays, New York Life, Securitas, Kimberly-Clark, and Netgear. 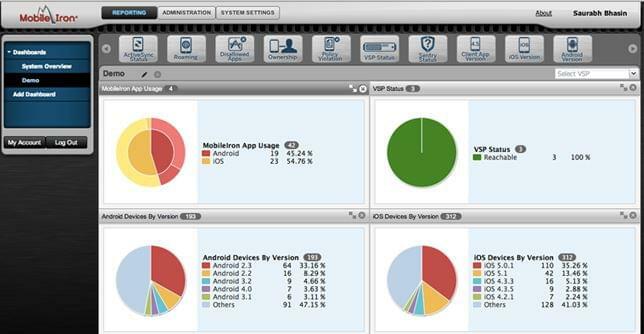 MobileIron’s device management platform is designed to secure and manage any device using Windows, iOS, or Android. This mobile device management platform supports company-issued and personal devices and is available for use on-premises or via the cloud. The program allows for mobile application distribution and remote access control. For enhanced security, MobileIron employs a Layered Security Model which helps protect sensitive corporate information without affecting the user experience. MobileIron is unique in that it offers BlackBerry migration, which lets companies offer a choose-your-own-device approach to mobile computing. Ccompanies around the globe value MobileIron’s enterprise-level device management solution for its proven ability to enhance mobile security, scale with business needs, and ensure reliable performance for end users. Philip Morris International, a global leader in the tobacco industry with over 80,000 employees, needed a mobile device management solution that would grow with the company’s needs, enhance the user experience, and provide consistent security. They chose MobileIron’s Mobile IT platform to accomplish this. As a result of implementing MobileIron, Philip Morris International was able to maintain accurate mobile inventories worldwide, secure personal and corporate-issued devices, and boost employee productivity through custom company applications which are accessible on any device. Review more of the top MDM/BYOD solutions with our SmartAdvisor. Learn everything you need to know about MobileIron. Our experts will reach out to you shortly.